This article is part of a series on local business success stories. HAGERSTOWN, MD - Very few people in Hagerstown and Washington County haven't heard of Chris Abbott. 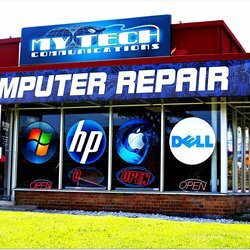 Between his controversial social media posts and his unorthodox marketing strategies, most of the surrounding area knows about the My Tech computer repair shop located at 701 Dual Highway. Chris established My Tech in 2009. His business has grown by leaps and bounds, as he continues to provide quality service at affordable prices. He provides personalized service for every customer, and works with them to provide the best repair option at the lowest cost. I have personally encountered the quality of Chris' service, not only through servicing my own computer systems, but through random encounters with other customers. The story which sticks in my mind the most is the time I was in a local store looking at computer accessories, when another customer asked me if I knew anything about computers. When I told her I did and asked what sort of issue she was having, she proceeded to tell me that she was sent there by Chris at My Tech to buy an external USB keyboard, so she could avoid the cost of repairing her laptop's broken keyboard. I was absolutely amazed, here is a man who will tell customers how to avoid paying him for repairs! You can't find service like that anymore. You enter My Tech as a customer, and leave as a friend.